Size 1600 x 1600 x 1200mm high. 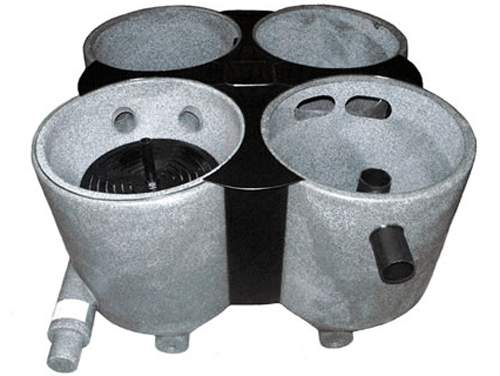 Suitable for Koi ponds up to 10,000 gallons (45,000 litres), or Goldfish ponds up to 20,000 gallons (90,000 litres). As standard this system is supplied without a lid, and without any filtration mediums - thus giving the pondkeeper full flexibility in choice. A CL4 Optional Media Kit is available at extra cost including Brushes, Jap-Mat, Foam & Aquarock. General description as for "CL2" & "CL3" filters. Note:- Pipe inlet size 160mm (6") - Outlet 100mm (4"). The site installation of the CL4 model is unique to the range, in that pressures on the casing welds brought about by the weight of water (approx 1 ton per bay without media) requires that the unit needs to be placed on a firm level concrete base, and partially encased in concrete to provide lasting stability and a long life. This applies regardless of whether the unit is pump or gravity fed, and the attached diagram illustrates the basics of what needs to be achieved. Should any further technical clarity be required do not hesitate to contact the us.